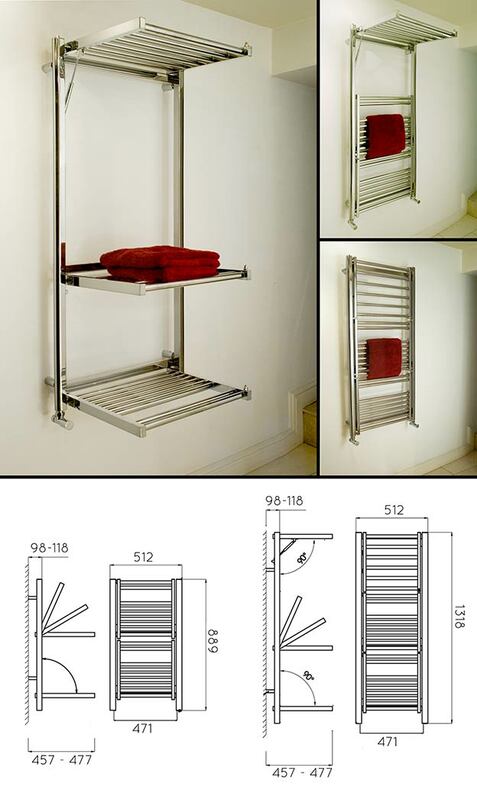 This impressive heated multi level towel rail is unique in radiator design. The latest in bathroom design, this folding towel radiator has folding shelves that easily fold down when required and neatly fold away when not in use. This heated towel warmer is ideal for space restricted bathrooms and apartments but also make a lovely design statement in larger bathrooms. Shown here with 3 folding tiers but also supplied in a 2 tier version. Depth of heating radiator shelves when lowered is 477mm. All folding bathroom towel rails are available for central heating and electric only systems. • 4 rail sizes available for central heating. • 1 rail size available for electric heating. • Allow 8 weeks for delivery.